Are you worried about a window cleaner’s head popping into view when you are in the upper floor of your house, in your bedroom or bathroom perhaps? With the Reach and Wash window cleaning system this is no longer a worry. The window cleaner works only from the ground ensuring the customer’s privacy at all times. 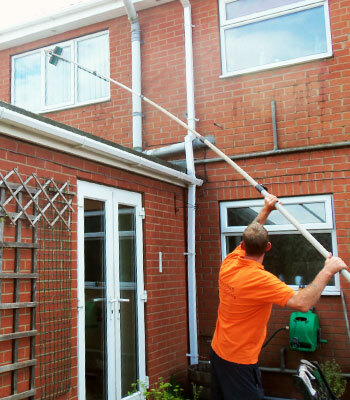 Our purified water is pumped through a telescopic pole which can reach up to 45ft without causing damage to lawns, flower beds, window frames or window sills (as is the risk with traditional window cleaning techniques that make use of ladders). The Reach and Wash method is a more superior way to clean your windows meaning that our quality results are not compromised by your need for privacy.